This variety is originally from Burgundy. There is no officially recognized synonym for this variety in France.In the European Union, Pinot noir N can officially be called by other names: Blauer Burgunder (Austria), Blauer Spätburgunder (Germany), Blauer (under certain conditions in Italy), Blauburgunder (under certain conditions in Italy), Clevner (Germany), Pinot Nero (Italy, Germany, Bulgaria), Samtrot (Germany), Modri pinot (Slovenia), Spatburgunder (United Kingdom, under certain conditions in Italy), Pinot Noar (Bulgaria), Blaw Shpet Burgunder (Bulgaria) and Rulandské modré (Czech republic, Slovakia). In France, Pinot noir N is officially listed in the "Catalogue of vine varieties". This vine variety is likewise listed in the Catalogues of other European Union member states: Germany, Austria, Belgium, Bulgaria, Cyprus, Spain, Great Britain, Greece, Italy, Hungary, Luxemburg, Malta, Netherlands, Portugal, Czech Republic, Romania, Slovakia and Slovenia. - round-shaped or slightly elliptical shaped berries. Bud burst: 2 days after Chasselas. Pinot noir N is particularly adapted to temperate climate zones. This variety is able to express itself and give best results in clay-limestone terroirs. In hot climates, grape maturation is very fast. It is sensitive to sun burn and the berries tend to wilt quickly when over ripe. Pinot noir N is generally trained. It most fully expresses itself when vigor is low to moderate and yields are limited. This variety, which requires careful debudding tends to produce large numbers of grappillons. 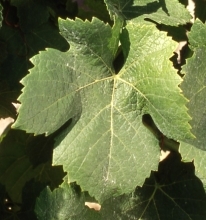 Pinot noir N is a delicate vine variety and is sensitive to major diseases, particularly downy mildew, rougeot parasites, grey rot (on clusters and leaves), and leaf hoppers. Grape clusters and berries are very small to small in size. Pinot noir N, under favorable conditions, can produce extremely high quality red wine which can be aged by combining finesse, intensity and aromatic complexity. Sugar accumulation potential is high for a just moderate acidity (sometimes insufficient when ripe) and a color which is oftentimes not very intense, but can be maintained over time. Pinot noir N is likewise used for quality base wine for producing sparkling wine. The 45 approved Pinot noir N clones carry the numbers 111, 112, 113, 114, 115, 162, 163, 164, 165, 236, 292, 372, 373, 374, 375, 386, 388, 389, 459, 460, 461, 462, 521, 528, 583, 617, 665, 666, 667, 668, 743, 777, 778, 779, 780, 792, 828, 829, 870, 871, 872, 927, 943, 1184 and 1185. Conservatory collections, set up in Alsace, Burgundy (Côte d’Or and Saône-et-Loire) and in Champagne between 1971 and 1995, account for close to 800 clones. Irregular production. Slightly more susceptible to grey rot clone. Clone appreciated for its steady production, its agronomic characteristics and the quality of the wines produced. Good capacity for making wines with ageing potential. Can be used for making sparkling wines, but considered « not distinctive » in Champagne. Yield need to be controlled. Can be used for making sparkling wines. Fleshy berries. Clone considered as « distinctive » in Champagne. Clone considered « not distinctive » in Champagne. Satisfactory quality is yield is controlled. 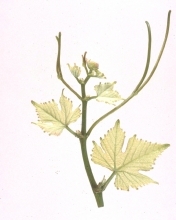 «pinot droit» type upright plant growth. Good behaviour in the Languedoc region. Clone appreciated for its agronomic characteristics and quality of wines produced. Good aptitude for making wines with ageing potential. Clone appreciated for its agronomic characteristics, the quality and the color of the wines produced. Good aptitude for making wines with ageing potential. More drooping plant growth. Use with care due to particular behaviour depending on the vintage. Clone slightly susceptible to millerandage but less than 1185. ▲ ❍ medium ★ medium ▼ high ✪ wines appreciated for their olfactory intensity and tannin suppleness.